The second piece of Schumann's Kreisleriana has posed special interpretive problems not merely for pianists; it seems to have posed such problems for Schumann himself. In preparing this movement for its second edition in 1850, he made not only such isolated though crucial changes of harmony and dynamics as he made elsewhere in the work; he also altered its formal proportions substantially, adding twenty measures to the first reprise of the theme in order to bring this theme back in its entirety, and partly compensating for this expansion by deleting eight measures from the second and final reprise. Schumann's changes of heart also affected this movement's very first phrase (Example 1): while the first edition makes a crescendo from mezzo forte in the first measure to forte for the dominant seventh chord in the second, the second edition indicates a swell within piano for the neighbor motion, F-G-F, within the first measure and a sforzando for the second. Taken literally, either set of dynamic markings can produce results ungrateful enough to bewilder a pianist trying to settle on an image of how this opening should sound. Whichever version of them one comes to prefer, these dynamics are difficult to construe as reflecting the shape of the gesture to which Schumann has applied them. For this seems a simpler opening than these dynamics suggest, one in which a melodically active measure of tonic harmony leads into a measure of dominant harmony supporting the melody's longest but also lowest note. The upbeat introducing the first measure and the dissonant neighbor-tone G within it only lend it additional weight, so that the forte or sforzando within the second measure contradicts rather than enhances the way most pianists would shape the gesture in the absence of dynamic markings. One must therefore probably look beyond this opening gesture to make sense of these dynamics, to larger phrase rhythms or to reinterpreted recurrences of the same gesture later in the piece. In themselves, these dynamics are difficult to imagine convincingly. The immediate continuation of this opening, of course, only insists on it rather than making it more understandable. Exactly the same gesture comes again, with exactly the same voicing and dynamics in each edition as the first time. Yet even without grasping more about this opening than its basic harmonic and melodic structure and its initiating function, one can now add an important observation about its performance: as with any short idea immediately repeated, most performers will inflect the second occurrence slightly differently from the first. I can imagine only with difficulty how such differentiation of a repeated idea might reflect a specific analysis rather than merely a personal preference; yet many performers consider differentiations of this kind essential to their art. The need performers feel for such in a sense arbitrary, individualistic inflections reveals something of the essential contingency of performance, the involvement of a particular performer with a particular piece at a particular time. But at least as importantly, this need reveals the fundamental role of the performer in creating the illusion that the music is itself alive, that it hears itself and continues on the basis of what it hears. Performers lend the music their hearing and their capacities for utterance; they hang their being, their imagination, on the music and live for the moment through it. The performer ready to perform is one who can hear inwardly every element of the music to be performed, who can use this hearing to bring every detail of a passage into vivid interaction with every other, who can project everything as his or her own thought in order to create the illusion that the music does it all by itself. In this second piece of Kreisleriana, pianists must find a way to imagine every sound of what Schumann wrote—with one set of dynamics or the other—well enough to intend it as their own thought or action. The forte or sforzando in the second measure has to belong with its musical surroundings, to contribute to some recognizable musical pattern. Certainly the dynamic markings in the continuation of this opening passage do nothing to suggest such a pattern, for measures 5-8 carry only a single dynamic marking, the piano at the upbeat of measure 5. However, some simple analytic observations begin to reveal a rhythmic pattern linking the two opening subphrases of this sentential phrase to its continuation. The melody returns to F in its highest register in measure 6, falling from there to the perfect F-major cadence in measure 8. The high F in 6 not only continues the line initiated by the F-G-F figure in 1 and 3, but also responds to and balances the low F's in 2 and 4. This high F also carries special emphasis because of the F-major six-four chord that supports it, making this measure—at least by traditional criteria—harmonically as well as melodically more accented than the measure that follows it. Like most eight-measure phrases arranged in a 2+2+4 pattern, this one groups without strain into four two-bar hypermeasures. But since it is possible to hear the six-four chord in measure 6 as metrically stronger than its resolution to a dominant seventh in measure 7, it introduces a potential hypermetrical syncopation. The accented chords in measures 2 and 4 can then anticipate this syncopation, and form with it what I might call a counter-hypermetric pattern. The low F's in 2 and 4 belong with the high F in measure 6, and it can help the performer to imagine an appropriate accentuation for them by already projecting an image of the high F in 6 while playing them. This entire eight-measure phrase exhibits an absolutely regular surface harmonic rhythm of one chord per measure: each of its three subphrases begins with a measure of tonic and ends with a measure of dominant, itself tonicized at the cadence in measures 6-8. One account of the eight opening measures, therefore, can take three of them as tonic and the other five as essentially dominant. Though most tonal openings stress both tonic and dominant harmonies strongly, this one might be said to overemphasize its dominant, both melodically and harmonically, as if stuck on it. Of course one cannot prove this statement: it represents a judgment, an evaluation of a musical situation, an assessment like those one makes of situations of any kind. But Schumann's strange dynamic markings become easier to hear if one allows them to suggest such an assessment. This interpretation, though never provable, can become more and more convincing if it also suggests plausible ways of hearing the larger contexts of the entire theme and the entire movement. As the theme continues, it could either remain caught on the F or break away from it in a way that retains the memory or image of the F as a point of departure. In the second phrase (m.9ff), the melody moves to the tenor register and, beginning with D, the pitch class so prominent in the initiating tonic measures of the first phrase, moves up through to a chromatic intensification of the F into E natural, F and . The goal of this phrase's melody is G, and it is on G, now back in its initial soprano register, that the continuation now dwells. Not only does this G return to the register of measures 1, 3 and 6, but it has already occurred as the high point of the first phrase, as the pitch to which the melody reaches up through the F, but which—to make another interpretive assessment—it cannot hold on to. This way of reaching up to G but then falling back from it to F dramatizes the overinvolvement of the melody of this opening phrase with F. Even the first G's might thus embody a wish to release the melody from the F's, or to move beyond them. And if one hears the G's in this way, a more sustained and fulfilled motion to G can exemplify progress toward the attainment of that release. The motion of the second phrase towards G not only transforms the F through chromatic inflections, but just as it does so accelerates the harmonic rhythm for the first time. Partly because of this acceleration in measure 11, partly because of the melodic ascent to G that it reinforces, measures 9-12 function as an extended upbeat to the G-minor measures that follow, measures whose upbeats echo the movement's opening but whose rhythmic accentuation fully coincides for the first time with their hypermetric accentuation, in order poignantly to emphasize the G itself. In their rocking rhythm these measures reach no cadence, but instead propel the phrase further, into a third subphrase (m.17ff) in which the dominant harmony reemerges over a pedal on its own dominant, and the melody soars up past G to its high point, A. Despite the subtly kaleidoscopic chordal shifts on the music's surface, harmonic motion becomes relatively stilled in this last subphrase. Much as my analytic observations about the first phrase have elaborated upon a way of hearing the F's in the opening gesture, these observations about the second phrase heighten the resonance and significance of the G's in that same opening. While the first phrase dwells on the F with quiet insistence, the second phrase moves to and dwells imploringly on G before passing on to A and so back into the harmonic region controlled by F. Although a Schenkerian analyst would probably hear D rather than F as the primary melodic tone of this movement—and if so would understand F and G as implicated in its expansion—F and G both figure so prominently in the unfolding of the theme as to obscure somewhat the structural hegemony of the D. Their prominence thus contributes to the questioning, reverie-like quality of this theme. The opening gesture returns in measure 21 to begin the third phrase, thus making the structure of the theme in effect ternary. But instead of repeating the entire opening phrase in its persistence on F, this third phrase continues more actively, again accelerating the harmonic rhythm in measures 25 and 27, and within each of these two measures also passing up from F to G through , in this way blurring the distinctness of F and G (as measures 17 and 20 already begin to do). In the last phrase of the theme (m.29ff), G and F reemerge as separate (in 30 and 32), but since both occur as successive high points in a sequence both share equally in a natural melodic continuity. So far this theme has exhibited a very regular hypermeter, each phrase having eight or twelve measures grouped in twos and fours. One could bring this last sequence to a full cadence within the same hypermetric framework; but no dominant preparation of sufficient weight has occurred to prepare the theme for such an uneventful yet definitive cadence. The sequence just heard has more the effect of setting the melody freely into motion for the first time than of closing or summarizing a motion already mostly accomplished. At the same time, the tonic pedal persisting throughout the sequence makes it floating and dreamy. When it extends itself into an extra ninth measure, expanding the length of a hypermeasure for the first time, it trails off, losing direction. Its cadence hardly cadences, instead merely marking a temporary stilling of motion. The left hand crosses over the right and calls a halt with the quiet, half-willed that falls back to F.
The right hand, of course, could play the cadential without any difficulty, the left in the meantime taking over the melodic descent that continues beneath it. 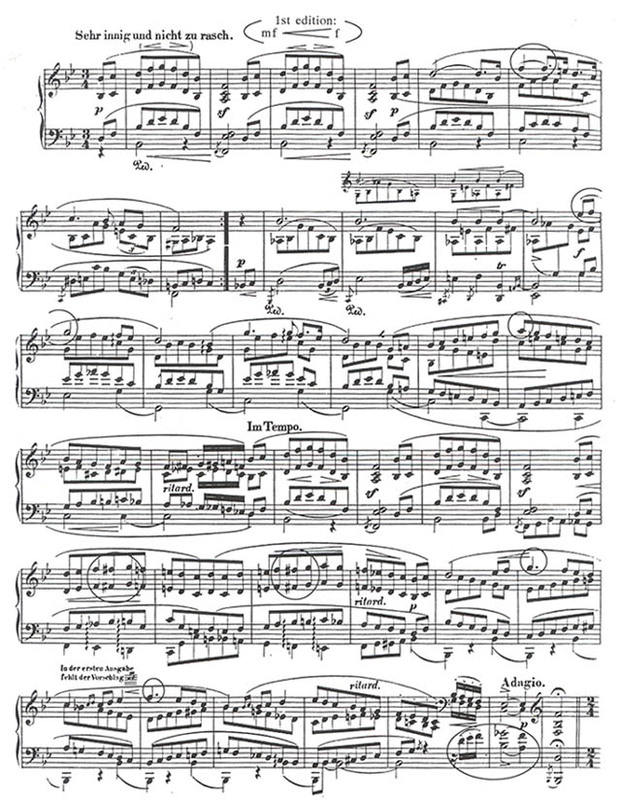 Schumann's assignment of the —with its upbeats and resolution—to the left hand makes a recommendation for the pianist, one that many pianists could easily decline without affecting the sound of the passage. 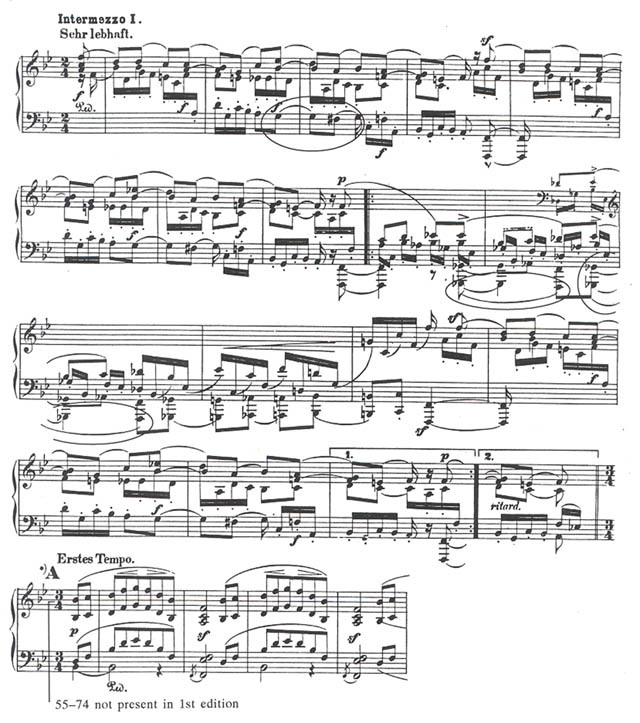 Perhaps it is easier to control the sound of the descending thirds by keeping them in the right hand, but Schumann's advice to the pianist here reflects more than convenience of execution. It suggests both that the -figure belongs to the same melodic line as what precedes it in the left hand, and further, as I have already speculated, that the intervenes here, emerging from another "psycho-physical" as well as musical register to mark a point of repose for a rumination that might otherwise continue indefinitely. Simple hypermetrical regularity is already irretrievable here; the , emerging in a sleight-of-hand, registers this disturbance for consciousness. The entire theme of the movement, its A section, is now presented, and has been descriptively re-presented here. What do performers stand to gain from this representation? What decisions can they base on these observations? If they seek to derive decisions from these observations, the answer to the second question might possibly be: none—none, at least, unambiguously. For the performer's self-constitution as a listener and agent within the music must remain part of the experience of performing just as much throughout the theme as in the simple repetition of its opening gesture. On the other hand, all agents need to base their actions on assessments of the situations to which these actions respond; performers' enactments of the music must obviously take into account, but at the same time draw on other resources besides, consciously formulated analytic observations about what they play. My observations here center on a story about F and G—a very special version of the expansion of the upper neighbor of the dominant often carried out in tonal music. The stages of this story become articulated through a succession of phrases of different kinds. Different performers, in their own ways, must move through this succession of phrases, differentiating the various kinds of motion that they involve, marking the structure and character of each phrase both as a response to the events of the preceding phrases and as a suggestion of the possible range of events of the following ones. The pianist needs to hear every note but at the same time has to focus and structure this hearing, finding tonal and rhythmic frames within which to take imaginative hold of all the otherwise unassimilable tonal and rhythmic detail. Thus in this piece it helps especially in shaping an image of the surface detail to identify consciously the slow underlying harmonic rhythm, and the occasional changes in this rhythm, and so always to keep the longer and shorter bass notes in awareness as a framework for the faster-moving melody and inner voices. Whether the melodic goals F, G and A are accented or not, the performer will gain focus by understanding the potential musical (and emotional) effect of the arrival of these tones, which articulate the stages of musical action within this theme. Before considering, briefly, the rest of the piece, I pause to make explicit two questions I want this consideration to address. As an analyst of the piece, formulating a narrative about the roles of F and G within it, I want to investigate whether I can plausibly hear the two contrasting Intermezzi (B and C within an ABACA structure) as continuing that narrative, or whether the at the cadence of the theme signals the temporary abandonment of this narrative. As a performer of the piece, I of course want to develop aural frameworks for hearing the contrasting sections—patterns especially of voice-leading, phrase rhythm and harmonic rhythm—but most specifically, I want to find reasons for preferring one of Schumann's sets of formal proportions to the other. Assuming for the moment the legitimacy of choosing either the first or the second version, I hope that closer observation of the entire movement will help to convince me of one of the alternatives. In spite of the retention of the opening -major key signature, the first Intermezzo (Example 2) is not only in F, but emphasizes the pitch-class F especially strongly. The second Intermezzo (Example 3), for all its chromaticism and metric ambiguity, clearly explores G as a harmonic region, thus responding to and balancing the first Intermezzo's emphasis on F. The following music (Langsamer—Example 4), returning to the tempo of the theme, begins by echoing in D minor the second Intermezzo, but culminates in a rediscovery of the opening theme in . As the tonality of the theme returns to , the bass plays on the double meaning of the - , first taking it as to F (ms.136-137), then as to G (138-139). A prominent G then initiates in measure 140 the melody of the following cadence (Adagio), arguably the structural cadence of the movement. Not only the course of the theme, then, but the course of the entire movement perpetuates and enlarges upon the emphasis of F and G that marks the theme's opening. The first Intermezzo (Example 2), with its staccato articulation and its shorter, duple measures, each of them introduced by a new accent, brings the movement's fastest, most rhythmically defined and confident music. The accented, imitative upbeats produce a syncopated effect, an effect made explicit by the actually syncopated G introducing the bass of the third measure. This G produces the strongest accent in the phrase, marking the strong third beat of a four-bar hypermeasure. In binding these four measures together, it defines a playfully subversive role for itself even in this F-oriented context, coloring itself distinctively through its lower neighbor. In the second half of the Intermezzo, becomes again and is as such not only syncopated, but syncopated twice, both times resolving to F before becoming in effect again to initiate a chromatic bass ascent up to C. The repetition of the syncopated produces a hypermetric disruption, a five-bar hypermeasure, only the second such disruption in the piece and, like the first one, colored by . Thus the story of F and G not only continues in the first Intermezzo, but accounts for what can easily serve both performer and listener as its focal points. 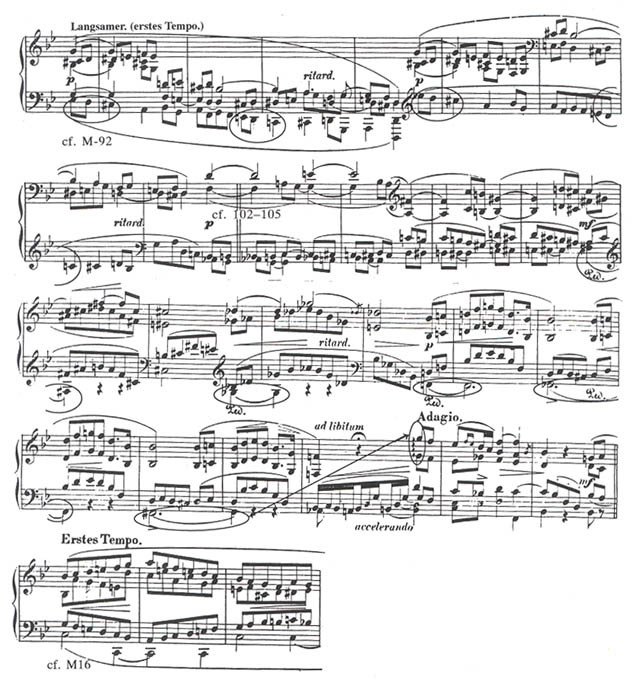 In the return of the theme after this Intermezzo, the pianist faces the choice, already mentioned, between the original (1838) edition, in which only the final phrase group (21-37) recurs, and the second (1850) edition, which brings back the entire ternary structure of the theme. Obviously no pianist should make this choice without considering its effect on the whole movement; but part of the effect of choosing the second edition is to repeat the entire unresolved tonal drama of the theme, in most performances lasting about two minutes, after an Intermezzo of only about thirty seconds. The second, G-minor Intermezzo is about twice as long as the first, and more complicated both rhythmically and texturally (Example 3). 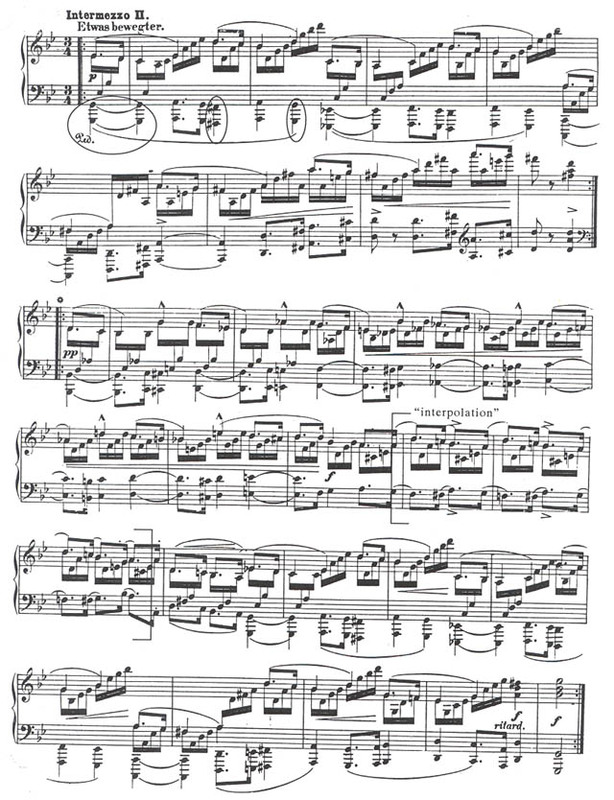 Like many passages in Schumann, it dwells obsessively on a single rhythm; but the motivation for its obsessiveness may derive from the ambiguity of the rhythm itself, whose upbeats forever threaten to become downbeats. The left hand incorporates an imitation of the right at two beats, further obscuring the triple meter. This music swims anxiously, as if it has to struggle to achieve a rhythmic and melodic hold upon its G-minor tonality. Reductive simplifications of this passage can help the pianist to imagine it, clarifying its harmonic and metric structure and also, incidentally, revealing the relation of its initiating bass to the G- -G figure so prominent in the bass of the first Intermezzo. In the music after the double bar, such simplification proves especially clarifying: once one "rectifies" the left-hand syncopations, a new diminished seventh chord emerges on every downbeat from 103 to 106. The ensuing two measures of implied 2/4 signal the climax of this progression, in which a diminished seventh resolves to D minor, by leading to a reiteration of the first D-minor measure (109 essentially repeats 106). Playing measures 100-106 and then connecting 106 to 110 produces an eight-bar phrase, within which 107-109 occur parenthetically as an intensification. Once again, the hypermetric (and here even metric) disruption that these measures bring about involves the mediating chromatic pitch between F and G, this time occurring as . The music threatens to get caught again on the F, but in these measures struggles away from it to the G once more. The performer can imagine this phrase rhythm clearly by arriving at a strong measure in 106, but then in a sense backing up to arrive at this same place again, even more emphatically, at 109. The return to Tempo I (Langsamer—Example 4) begins as an aftermath of this turbulent Intermezzo, echoing both its three-note head motive and its metric ambiguity, and displaying a more ruminative obsessiveness in its fourfold variation of the same two-measure harmonic-contrapuntal idea. The tonicization of D minor retains G and F as participating, even accented tones, but allows them to recede somewhat in relation to D. The brooding ascent by whole tones from 127 to 130 remembers the ascent, also by whole tones, from 102 to 105. But now, instead of getting caught up again in releasing F into G it emerges into an epiphanic major, catching the theme in the magic net of a remote tonal region whose dependence on F and G in this context is momentarily forgotten. Even in this far-away sounding , the opening two-measure idea is, as always, repeated. But this time, instead of falling to its dominant the second time, it bypasses this dominant. , now respelled once again as , falls to F, the bass of a tonic six-four over which the opening motive comes again. Now beginning over its dominant, this gesture needs to find a new harmonic counterweight in its second measure, and finds this counterweight in a return to the . Again the slides down to F for the repetition of the same gesture, and again the bass rises back by half-step for its second measure, this time to another , in order now to pass on to G minor for yet another repetition of the opening idea. The same two-measure melodic shape thus comes here five times in a row, finally freeing itself harmonically from the overdetermination of F and leading to a strong cadential idea whose melody begins with an upbeat that descends from G through F, as if to signal the resolution of their story. It is hard to imagine conveying the dramatic-tonal effect of this passage without clearly imagining and projecting the resolutions of and in its bass. Although this cadence concludes a twelve-measure passage—by some criteria a single phrase—based on the theme, a literal return of material from the theme only follows it. This return begins, as it were, in mid-stream, with the third subphrase of the second phrase (first occurring at m.17). The first edition repeats the return of the theme after this subphrase (m.21ff), while the second moves directly into its final sequence (m.29ff). In either case, a much stronger cadence than any of those in the theme itself immediately precedes all of the literally returning material, so that the question of which edition to follow is more a question of proportion and dramatic appropriateness than of structural necessity. The subphrase ascending to A, more a finding than a seeking now that it follows the structural cadence, is the one that initiates this last return in both versions. For me, this final return, this memory, is more surprising, more an event if one has heard this material—as in the first edition—only once, and in a sense "long ago," early in the piece. For this reason, as well as because of the redundant effect of hearing the entire theme in its first return after such a short first Intermezzo, I prefer the first edition. Both editions include a repetition of the theme's final phrase, but only four measures of the sequence first heard in m.29ff return in their original register: enough to reiterate the high points G and F and to allow the F, as the ending of a subphrase, to come into focus as the resolution of the G. The entire original nine-measure sequential phrase now follows an octave higher, transformed into a coda in its echo-like change of register. Its cadence still tentative, another cadential subphrase succeeds it this last time, one that allows the notated of its prolonged upbeat actually to become an by taking it up to G and from there up to the tonic. I have followed through to its end an account of this piece that focuses especially on the roles of F and G, and of the and involved with them, as a key to its basic musical action. I do not expect listeners to recognize or reconstruct such an account on the basis of my performance, nor do I consider it important for them to try to do so. But in preparing my performance, I have retained and developed this account and used it to focus my hearing of virtually every passage in the movement. I can only hope that the definition and direction that I have tried to bring to my performance through it can help this performance to engage those who hear it with the vividness of a real situation, a strongly shaped and fully lived experience in which—to offer a familiar metaphor—the theme and the Intermezzi belong together like a meditation and the specific memories or dreams that its focal images conjure up. As with the Arabesque, I have supplemented analytic observations in the current discussion of Kreisleriana with assessments of musical character. I have described the theme of this second movement as "questioning" and "reverie-like," its first Intermezzo as its most "confident" and "rhythmically defined" music, its second Intermezzo as "obsessive" music that "swims anxiously," and the ensuing return to Tempo I as an "aftermath" that displays a "more ruminative obsessiveness." Finally, I have characterized the repetitions of the opening motive at the end of this episode (m.131-142), after its emergence in an "epiphanic" major, as releasing that motive "from the overdetermination of F." I have referred to my account as a "story"; but it probably strikes most readers as lacking in both narrative continuity and characterological motivation. Perhaps the familiar, just adduced Romantic theme of recollective meditation can help to draw these characterizations together into a compelling succession: the quiet insistence on F in the theme makes it like a reflection, or an attempt at recollection, that has not yet found its object; the metrical disturbance at the end of the theme might signal the intrusion of the first object of reflection, a playful, initially untroubled memory; the second Intermezzo might then embody a later, more troubled memory, one giving rise to the brooding return to Tempo I before the theme itself can return. As in the Arabesque, the last return of the theme can signal the overcoming of an obsession, a coming-to-terms with memory, although the obsession only reveals itself later here, coming after an earlier, untroubled memory. But further considerations, of a kind not applicable to the Arabesque, might modify this account. This piece takes part in a larger whole, the eight-movement Kreisleriana, and its performer needs to consider just how it takes part in that whole. How does No. 2 contrast with the other numbers of Kreisleriana, and what does it share with them? These pieces alternate between agitated and lyrical music, the former most frequently in G minor, the latter almost always in major. The agitated episodes, sometimes passionate, sometimes mysterious or even sardonic, might seem emanations of Florestan, the stormier of Schumann's two alter egos. The lyrical episodes might then come from the dreamy Eusebius. But as is well known, the title itself comes from E.T.A. Hoffmann, and Charles Rosen has speculated that Schumann took his inspiration not from Hoffmann's Kreisleriana collection itself, but from the unfinished novel Kater Murr, in which Johannes Kreisler's cat, Murr, writes his own autobiography on the backs of the sheets of his master's autobiographical account.2 Rosen hears the sudden changes of mood and character in Schumann's Kreisleriana as stemming from the alternation of passion and satire in Hoffmann's novel, although seemingly without specifically programmatic correspondences to it. Whatever the specific literary or imaginative sources for Schumann, the tonal and characterological oppositions in No. 2 of Kreisleriana clearly instantiate those that pervade the entire Opus. And in my account of No. 2, the F becomes associated with the dreamy, more lyrical character (one whose recollections, too, seem for the moment untroubled as they return in the first Intermezzo) and the G with the agitated, more troubled one. Memories of the stark contrast between the violent outer sections of No. 1 and its dreamy middle section thus already hover over No. 2, which in turn sets the stage for an equally abrupt and even more violent characterological contrast in No. 3. The performer might therefore want ultimately to link characterological assessments of the episodes of No. 2 with similar assessments of the rest of Kreisleriana, and thus to tell a story embracing all eight of its movements. Even then, however, the listener will probably never guess what the performer has in mind. Although one can often infer from a performance at least some of what a performer thinks about the music performed, performance should not so much make mediating critical observations about the music as bring it to life, restoring to it the immediacy, the contingency and the specificity of vividly experienced events. Today it goes almost without saying that music is of course semiotic, a cultural product rather than a universal language, and as such full of symbolic resonance. But musical experience is not itself primarily symbolic, but instead primarily what I might call "imaginary." When we have specifically musical experience, not only perception of but imaginary identification with the sounds themselves, layered upon and interacting with themselves rather than with a different stratum of "meaning" lying behind them, fills our minds and bodies. Performers are not equipped so much to convey a message through music as to make its image potentially clear and active for listeners, vivid enough for it to function as if it were a real environment, a situation within which to gather the fullness of one's perceptual and emotional resources in a memorable and hence recoverable way. Musical analysis has value for performers inasmuch as it helps them to achieve such imaginary focus, making details audible by patterning them, hierarchizing them, and suggesting assessments of their character. Thus it can enable a performer to hold in mind a myriad of details as contributing to clear, graspable gestures, gestures that take possession, while the music lasts, of the imagination. 1The first part was published in College Music Symposium 36 (1996): 59-72. The reader is referred to this previous article for a fuller account of what is meant by a "performer's analysis." 2Charles Rosen, The Romantic Generation (Cambridge: Harvard University Press, 1995), 669-679.